Siberia is a vast region in northern Asia, stretching from the Ural Mountains in the west to the Pacific Ocean in the east. To the north lies the Arctic Ocean; to the south lie Mongolia, China, and Central Asia. European Russians have been settling in Siberia for several centuries, but the region's original inhabitants were hunting, fishing, and herding peoples whose cultures were related to those of other northern groups, such as the Inuit of North America. Siberian mythology and religion reflected a world in which humans depended on and respected animals, believing that the animals had spirits and could change form. Elements of Mythology. Traditionally, Siberians viewed the world as the middle realm—or region—in a series of three, five, or seven worlds that were stacked one on top of the other. As in many belief systems, the realms above belonged to good gods and spirits, those below to evil ones. A tree connected the worlds of Siberian myths in the same way that the World Tree Yggdrasill linked realms in Norse* mythology. The tree's roots and branches extended into all levels. Shamans held a central role in Siberian religion and mythology. They were believed to travel between worlds by climbing the World Tree or by flying, and they communicated with the spirit world through ceremonies and trances. The healing magic of shamans involved finding or curing the lost or damaged souls of sick people. Many Siberian myths deal with powerful shamans. The Buriat people of the Lake Baikal region told of Morgon-Kara, who could bring the dead back to life. This angered the lord of the dead, who complained to the high god of heaven. The high god tested the shaman by sealing a man's soul in a bottle. Riding his magic drum into the spirit universe, Morgon-Kara found the soul in the bottle. Turning himself into a wasp, he stung the high god's forehead. The startled god released the trapped soul, and the shaman carried it down to earth. One Siberian myth tells of a hero who followed a golden bird up the World Tree. The bird changed into many shapes, finally becoming a woman, whom the hero wished to marry. First, however, he had to destroy an extra sun and moon that were making the world too hot and too cold. For help, the hero turned to a sea god, who boiled the hero in an iron kettle and then shaped the fragments into a new man of iron, armed with iron weapons. The hero used these to shoot the extra sun and moon. The destruction and remaking of the hero's body may symbolize the making of a shaman, during which the person is reborn with magical powers. 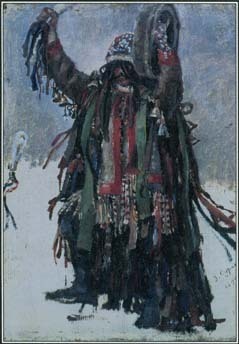 Shamans held a central role in Siberian religion and mythology. They were believed to travel between worlds and communicate with spirits through ceremonies and trances. winter in the cave of a female bear. The Evenk people had stories of mammoths, immense animals that roamed the land many, many years ago. They explained how these creatures had shaped the earth by moving mud with their tusks, created rivers where they walked, and formed lakes where they had lain down. Core Myths. Siberian mythology, which includes the beliefs and myths of a number of different peoples, has many variations on the story of creation. In one, the gods Chagan-Shukuty and Otshirvani came down from heaven to find the world covered with water. Otshirvani sat on a frog or turtle while Chagan-Shukuty dove repeatedly to the bottom, bringing up a bit of mud each time. The gods piled the mud on the back of the animal, which eventually sank into the water, leaving only the earth on the surface. In other stories Otshirvani took the form of a giant bird that fought a huge, evil serpent called Losy. The struggle between good and evil colors Siberian mythology. The devil or chief evil spirit was named Erlik. He was sometimes said to have been a human who helped in the creation of the earth but then turned against Ulgen, the creator god. Erlik ruled the dead, and his evil spirits brought him the souls of sinners. Siberian tradition includes myths about a great flood and a hero who saved his family. In one version, the creator god Ulgen told a man named Nama to build a boat. Into the boat Nama brought his wife, his three sons, some other people, and some animals. The boat saved them all from the flood, and they lived on the earth after it dried out. Years later Nama was close to death. His wife told him that if he killed all the animals and people he had saved in his boat, he would become king of the dead in the afterlife. Nama's son argued that the killing would be a sin, so Nama killed his wife instead and took the virtuous son to heaven, where he became a constellation of stars. See also Creation Stories ; Floods ; Yggdrasill .